SINGAPORE - Water agency PUB is investigating how construction works at a site in Tampines damaged a water pipe, leading to disruption to water supply at the nearby bus interchange and Eastlink Mall foodcourt. It said in a Facebook post on Friday (Nov 3) night that it had received a report of a pipe leak at the junction of Tampines Avenue 5 and Tampines Central 2 around 6am on Friday. The damaged pipe is still being repaired, with works expected to be completed by the end of Friday. The pipe was dislodged by ongoing construction work to put up an overhead pedestrian bridge, PUB said. It resulted in a pipe leak and low water pressure to affected customers. PUB said it is further investigating how the construction work damaged the water pipe, with "a view of taking enforcement action against the errant constructor under the Public Utilities Act". It had said in an earlier Facebook post on Friday morning that it immediately sent a service crew and contractors to the location. It added that a 20m stretch of road in Tampines Central 2, in the direction of Tampines Hub, was closed temporarily for repair works to be carried out. Temporary water supply was provided to the bus interchange and foodcourt, with PUB on-site with a water wagon and bags. In an update at 4.15pm, the agency said it had carried out valve operations to draw water from other unaffected pipes. "This has normalised water supply to customers who had earlier experienced poor pressure," it explained. It added that repair works were still ongoing, and were expected to be completed by end of Friday. Work at the the construction site - for an overhead bridge over Tampines Avenue 5 that leads to Tampines Hub - had also been stopped. 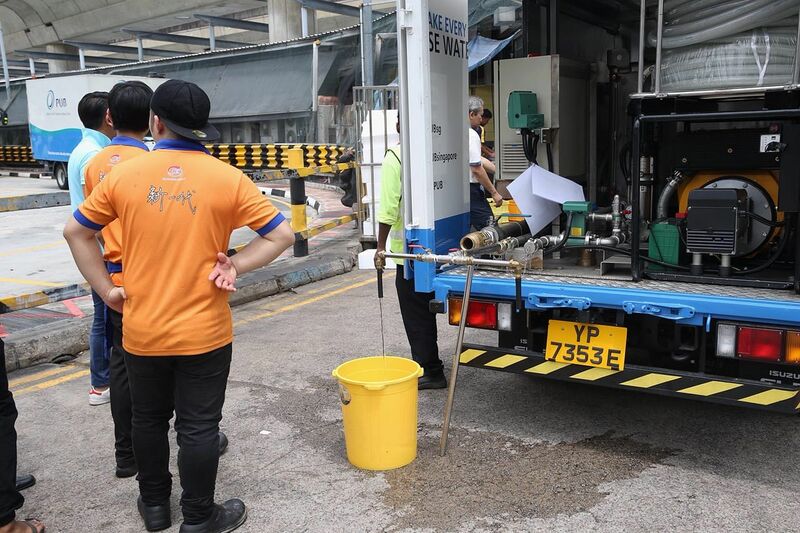 When The Straits Times arrived at the scene at about 12.40pm, staff from the foodcourt and interchange were queueing for water in front of a PUB water wagon. The manager of the foodcourt, who declined to be named, told The Straits Times that the taps had been running dry since 9am. "It has affected our turnover because there is not enough water to cook and wash the vegetables. Some stalls have not been able to produce food yet," he said. Ms Chiu Yan Chun, 39, an employee at Thousand Tastes, a stall at the interchange, said: "We were affected by the water stoppage and unable to wash any dishes for over three hours. The water stopped at around 7am to 8am so we had to go and collect water to make our food." She added that it was quite troublesome, especially since the stall sold steamed buns and needed water to steam the food. A cleaner at the interchange, who declined to be named, said it was fortunate that they had already finished their work in the morning. However if any emergency arose, it would be "very troublesome", as the nearest toilet for everyone's usage was at the MRT station. A canteen operator, who wanted to be known only as Bon, said that while they were affected, PUB's prompt action in bringing water ensured that they were not too badly hit. The only issue they faced was that they had to constantly refill their tanks and containers manually. 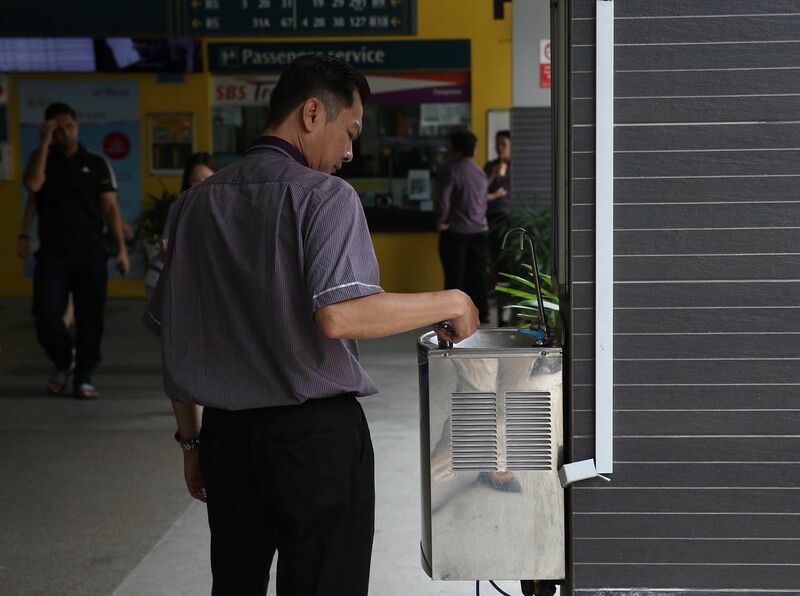 A staff member at the SBS passenger service counter said that many bus captains had no access to toilets and water coolers, and were instructed by their supervisors to use the nearby MRT toilets instead. This was the third incident involving a pipe leak this week. On Sunday, a burst pipe caused a 30-minute disruption to the water supply of residents living in Choa Chu Kang Avenue 2, while a burst pipe in Upper Serangoon Road on Monday closed two out of three lanes of the road. Anyone who sees any pipe leaks can call PUB's 24-hour call centre on 1800-2255782 to report it.